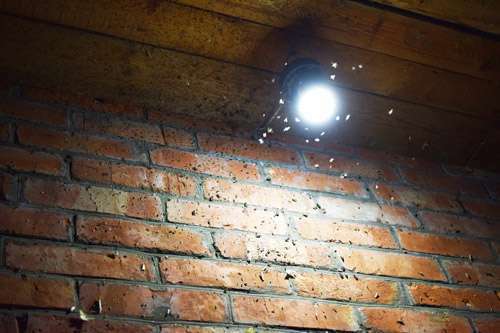 New research by scientists from the University of Bristol has revealed that domestic LED lights are much less attractive to nuisance insects such as biting midges than traditional filament lamps. The team now highlights the urgent need for further research on other heat-seeking flies that transmit disease, including mosquitoes that are carriers of pathogens that cause damaging diseases such as malaria and Zika fever. The study, funded by the Natural Environment Research Council and UK lighting manufacturer Integral LED, used customised traps at 18 field test sites across south-west England, illuminated by a series of LED, filament and fluorescent light sources. Over 4,000 insects were carefully identified. The results showed that LEDs attracted four times fewer insects compared with the traditional incandescent lamps, and half as many as were attracted to a compact fluorescent lamp. Notably, for biting flies (midges in the genus Culicoides, some species of which are vectors of wildlife disease), 80 percent were attracted to the filament lamp, 15 percent to the compact fluorescent and only 2-3 percent to each of the two different LED lamps. Dr Andy Wakefield led the field research in a project supervised by Professors Gareth Jones and Stephen Harris from the University's School of Biological Sciences. Dr Wakefield said: "We were surprised by the number of biting flies drawn to the traditional tungsten lights. We do not know why this is but we know that some insects use thermal cues to find warm-blooded hosts in the night, so perhaps they were attracted to the heat given off by the filament bulb." Co-sponsors of the study, Integral LED were instrumental in the commissioning of the project and provided technical and financial support. The UK company's Marketing Director Sanjiv Kotecha said: "As lighting manufacturers, we welcome that a link between LED lights and low attraction to insects has been proven. The energy saving advantages of solid-state lighting are well known, yet the benefits to well-being are only beginning to be revealed." More information: Wakefield, A, Broyles, MEJ, Stone, E, Jones, G & Harris, S, 2016, 'Experimentally comparing the attractiveness of domestic lights to insects: Do LEDs attract fewer insects than conventional light types?'. Ecology and Evolution. The shallow and superficial will take this only as a benefit, reducing the presence of annoying insects. In fact, though, among other things, a crucial question is why are insects not attracted to LED lights? The answer is that they are unnatural. The insects respond to natural like light. Even light bulbs have spectra similar to the sun, a black body radiator. The spectra of all LED lights is abnormal. One should ask what effect this can have on everything from physical health to mental reactions. The effect is probably because of the low CRI of the LED lamps and compact fluorescents. The light quality is bad, so the insects don't mistake it for sunlight or moonlight. The typical CRI for a compact fluorescent is 85, a LED lamp 50-80, while halogens and regular filament lamps get 99-100. With a specialty LED lamps such as the now-discontinued Philips L-Prize (CRI 92, $15 per bulb), there's no reason why the insects would make a difference to a regular lightbulb. If the insects are atracted to infrared, there is a big difference among those sources. And CRI is only comparing visible band. Just looking at nominal power intake LEDs use roughly 1/5 of incandescents, so the heat flow is at max that. But my estimate is that different insects are atracted by different light mix.